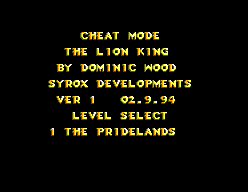 (Disney's) The Lion King / (Disney's) Le Roi Lion / (Disney's) Der König der Löwen / (Disney's) Il Re Leone / (Disney's) El rey león - Cheats - SMS Power! After turning on the game, a Walt Disney/Virgin screen with yellow letters will appear. Before it fades out completely, hold . The screen will stay black. Release and press . If performed correctly, you will hear a confirmation sound. Start a new game to access the level select screen.